omewhere on the Canada Line on a squelchy Friday night, my thumbs tap and swipe against a ruthless barrel barrage on my cell phone. 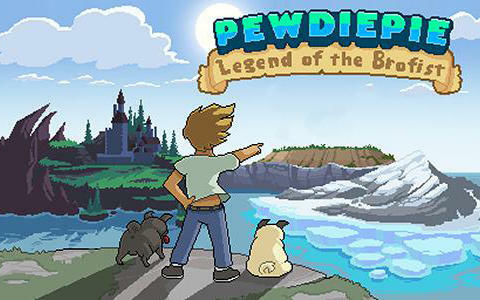 The game isn't a mobile port of the original Donkey Kong, but PewDiePie: Legend of the Brofist, a 2D-platformer mobile game. With all the rosy reviews online, how would someone, with two thumbs and no loyalty to his Bro Army or his detractors, feel about his game? To start, not all stages follow the A to B platformer maxim as you’ll leap from moving vans in Africa, shoot out ducks in a side-scrolling airplane shoot’em up stage, and survive encounters from a Slender Man archetype in a sub-par subway. You can pick several characters based on Pew Die Pie, and his friends, each with their specific power-ups like farting (another IRL shout-out to Pew Die Pie and Co). These power-ups and extra characters are fortunately unlocked through gameplay rather than micro-transactions. Although I adore off-beat games like Undertale or The Stanley Parable, this game tries too hard to make you say “WTFLOL”. The enemies are viral-fueled stuff like an emo keyboardist, random exploding animals, and the game's big bad is a gigantic barrel that kidnaps PewDiePie's fans. Also, most of the humour feels like fanservice for LP watchers, and awkwardness for non-LP watchers. Besides that, the music and graphics attempt to evoke NES-era nostalgia, but they lack the abundant charm in other retro-revering games like Scott Pilgrim or Cave Story. Lastly, garbage controls in a platformer is grounds for bargain bin exile. Two things: one, thumbs over the screen means you may block incoming enemies or the character; two, the jumping just feels clumsy. I mosh-pit-jumped into enemies instead of over them far too many times. Admittedly, the thumb-on-screen issue may be imprinted in the DNA of mobile gaming without Blu-tooth controllers, but there's no excuse for making every jump a gamble. Until invisible thumbs are readily available, I can't recommend spending $6.75 on this game.